FREE with RSVP HERE - space is limited! 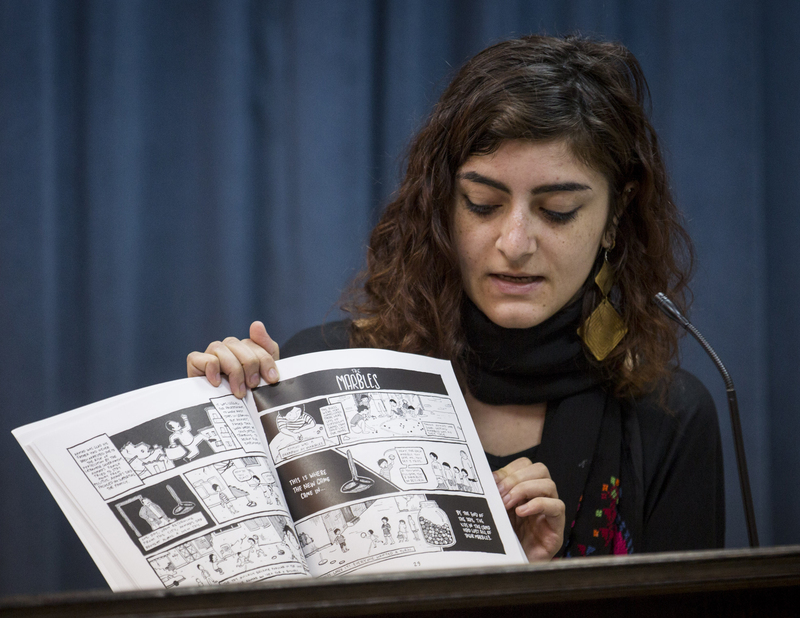 In this free interactive workshop, Palestinian graphic novelist, Leila Abdelrazaq, will lead workshop participants in a conversation and walk-through of her exhibit, Drawing in the Diaspora: Comic Art and Graphic Novels by Leila Abdelrazaq. Afterwards, participants will have a chance to create their own comic zines, with Leila providing prompts, guides and tips. Participants will leave with their very own one-page comic zine. Leila Abdelrazaq is a Chicago-born, Palestinian author and artist. Her debut graphic novel, Baddawi, was shortlisted for the Palestine Book Awards. Her creative work primarily explores issues related to diaspora, refugees, history, memory and borders. Abdelrazaq has been involved in both national and local community organizing around the issue of Palestine since 2011. She graduated from DePaul University in 2015 with a B.FA. in Theatre Arts and a B.A. in Arabic Studies. In 2015, she was a participant in the Palestine Festival of Literature. Her work has been featured in World War 3 Illustrated, VICE Magazine, The Electronic Intifada, and PEN America’s The Illustrated PEN, among others. She has spoken on programs such as Uprising with Sonali and WBEZ 91.5 (Chicago Public Radio) and has also given workshops and talks in classrooms, universities and conferences around the world, from the American University of Beirut’s Symposium on Arabic Comics to appearing at the first-ever ComiqueCon at AANM in 2015.